Millennium ago, a few hearty seeds and animals made it to Hawaiʻi and over time, they evolved into many different species, especially suited to the unique environment of our islands. The art exhibition, Hawaiʻi Nei, was created with the intent to celebrate these kamaʻāina while educating the public about these same organisms. Artists of all ages and skill levels are encouraged to learn more about the plants and animals native to Hawaiʻi Island and depict these species in the media of their choosing. As a result, the exhibition features works from elementary students to renowned local artists; photography to sculpture: all focusing on the unique flora and fauna that makes our home distinctively Hawaiʻi. Since 2009, Hawai‘i Nei has been a collaboration among the Three Mountain Alliance, a watershed coalition working across private, state, and federal lands to sustainably manage over one million acres for natural and cultural resources; the Hawai‘i State Department of Land & Natural Resources Natural Area Reserves System (NARS), the Hawaiʻi Island Art Alliance (HIAA) and Hawaiʻi State Parks Wailoa Center, serving East Hawai‘i for over 30 years as a center of culture, arts, and information. NATIVE OR NOT? WHY DO WE CARE? Hawai‘i is unique for its native species. You have probably heard that we have many species of plants and animals that are found nowhere else. Think about this -- nowhere else on the planet! Millennia ago, a few hearty seeds and animals made it here and over time, they evolved into many different species, especially suited to the unique environment of our islands. How can you tell if your subject is native to the Island of Hawai‘i? Contact Amelie at hawaii.nei.art@gmail.com or check out the resource page for information and inspiration. Three Mountain Alliance Foundation is organized exclusively for charitable, scientific and educational purposes. Its mission is to promote and sustain the health and benefits of the native ecosystems of Hawaiʻi by supporting responsible management, education, and research pertaining to watershed areas, native habitats and species, and historical, cultural, and socio-economic resources. Wailoa Center is located on Hawai‘i Island in the town of Hilo, HI. 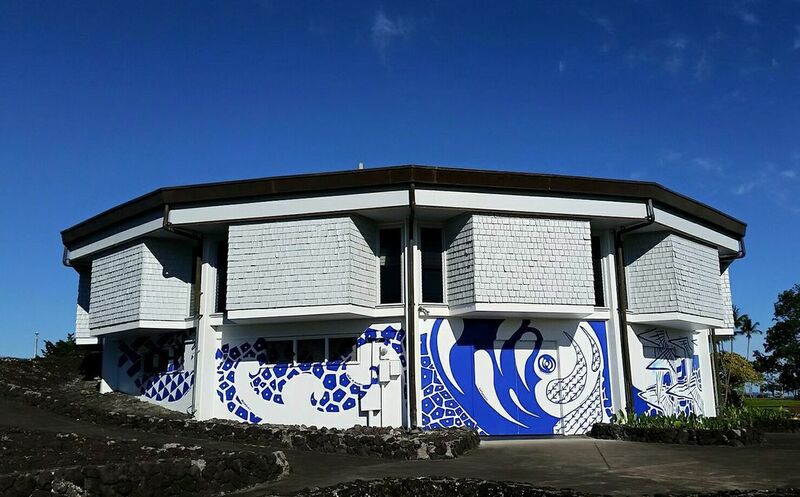 Wailoa Center is Hilo's premier art and culture center. Part of the Division of State Parks, Department of Land and Natural Resources, Wailoa Center is situated on the grounds of the Wailoa River State Recreation Area and is a showplace for local artists as well as exhibits from around the world. ​HIAA is a non-profit organization dedicated to support, promote and facilitate art in our Hawaiʻi Island community. The statewide Natural Area Reserves System was established to preserve in perpetuity specific land and water areas which support communities, as relatively unmodified as possible, of the natural flora and fauna, as well as geological sites, of Hawaiʻi. The system presently consists of 20 reserves on five islands, encompassing 123,431 acres of the State's most unique ecosystems. The diverse areas found in the NARS range from marine and coastal environments to lava flows, tropical rainforests, and even an alpine desert. Within these areas one can find rare endemic plants and animals, many of which are on the edge of extinction. The reserves also protect some of the major watershed areas which provide our vital sources of fresh water. The Natural Area Reserves System is administered by the Department of Land and Natural Resources, Division of Forestry and Wildlife. Currently, management teams are working to control the encroachment of non-native plants and animals which threaten the existence of the natural biota on the reserves. Like our page on Facebook for tidbits on native species, fun facts, and announcements on workshops, excursions and other exciting opportunities.